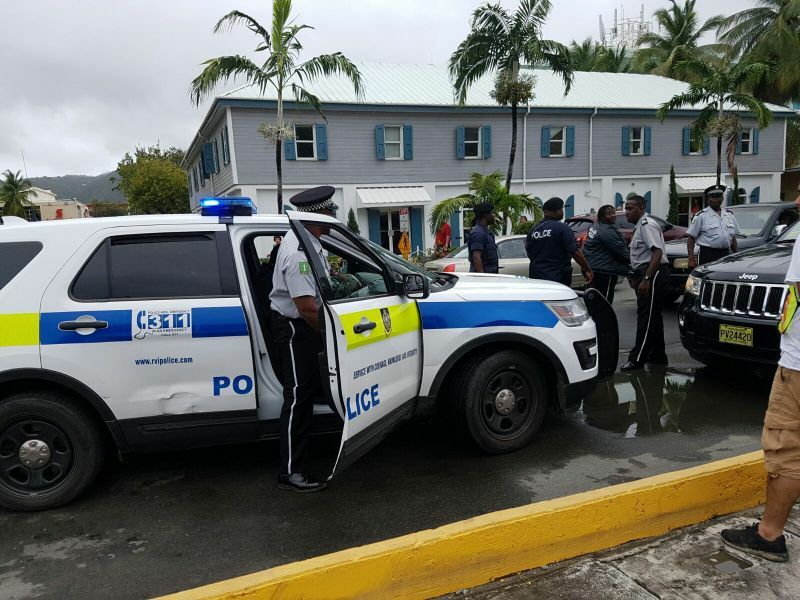 ROAD TOWN, Tortola, VI- The man who allegedly assaulted two police officers in Road Town on March 24, 2017 has been slapped with several charges. This news site had first and accurately reported that the two police officers were sent to Peebles Hospital following the alleged run-in with a civilian. In a press release today, March 28, 2017 Commissioner of Police Michael Matthews condemned the assault on the two traffic officers by a scooter rider last Friday on Waterfront Drive. “Violent acts against any of my officers are never acceptable. However, I am particularly disturbed by the level of this assault on Friday on my Road Policing officers who were simply carrying their duties to keep road users and riders safe. I have giveninstructions for the full force of the law to be exacted on anyone who decides to attack any officer while he or she is carrying out duties. The alleged offender, Mervin Flaherty Jr, 18, of McNamara, has since been charged with two counts of assault occasioning actual bodily harm, two counts of criminal damage, disorderly conduct and resisting arrest. He will also face several traffic related offences. The two officers received treatment at Peebles Hospital, were discharged and are now at home recuperating. Commissioner Matthews noted that over the same week, scooter riders had been involved in three accidents, two of which involved pedestrians while on pedestrian crosswalks. Both riders fled the scene before Police arrived. Pedestrians, in each case, were treated and discharged. “While there are scooter riders who follow the law, we do have many more who arrogantly violate the law and put pedestrians, other road users and themselves at risk. Beware that my officers will be targeting unlawful scooter riders and enforcing the law. We ask for the encouragement, support and cooperation of the public as we ensure that all operators of motor scooters follow the law and practice safety. It was about 8:50 AM today March 24, 2017 in the parking lot near the traffic lights in Road Town that there was a confrontation between a man and two police officers on police motor bikes. It appears that one of the bikes was damaged, while the two police officers ended up at Peebles Hospital with minor cuts and bruises. It is believed that the man was eventually arrested after police backup came to the scene. No more details have been obtained by our newsroom on the incident. @Fish, fighting for there rights? I never knew that you can disobey the law and want to fight for your rights at the same time. Those scoter riders are rude, disrespectful and have no regard for the public or the public safety. They act like they own the road and when the police intervene, the police is wrong. I am on the police side. 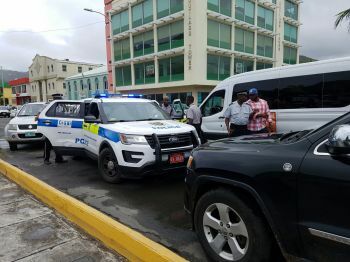 WHERE IN THE WORLD DO YOU SEE POLICE HAVE THE SAME SPEED OR LESS THAN THE CIVILIAN ON MOTORBIKES, WHY IN THIS COUNTRY THE BVI LANDERS ALWAYS AGAINST THE COPS WITH NEGATIVE TALK, IT LOOK LIKE THE POLICE SHOULD ALWAYS TURN A BLIND EYE TO THE LAW BREAKERS. Guns are also illegal but the police have them. Do you think that the police can catch these retards without having equal or more advantage? People seem to forget the overall duty is to protect and serve but please also remember that above all, the police are humans too. They don't have super powers, they can't read minds and they need us to help them just as much as we need them to protect us. Educate yourself, you are not helping save lives and protesting f our young men. Bring those bike riders into conformity with the law. That is where the law and order starts. No helmets, no bikes. Hold their bikes. I support the cops. We need a return to law and order. On second thought I don't think any of them are that intelligent. This is what we get with the $800,000 and John Duncan. Not a bad days work. @wize up...change your name to shut up. What police state do we have? Criminals are running wild in the place and we need a stronger police force to catch all of these criminals. Our families are being destroyed with all of the murders and avoidable traffic accidents. Police state my behind! @wize up - the police are not the problem. You are and people like you who are withholding information and protecting criminals whilst at the same time complaining police can't solve crimes. Be the change you want to see! Thank you NezRez, and the thing that really bothers me is that guy Wize up always say he was a police. I really hate to believe that. I am convinced, that whoever he is, he don't really have much sense. This is--to put it mildly--ridiculous. I can't believe what I am here reading. Come on, the police have to do their job. People it's time to abide by the law and respect the police officers them. Police officers you all are doing a great job and keep it up! i used to say is we tola people just dumb but it seem like all over the world that people think the police came about in order to fight crime. No the F they didnt, its all yall lazy backside who know somebody that know somebody that know somebody with a problem child and or law breaker but turn a blind eye and say that ain my business. then when its not someone of ur own u come on here to blog. in my generation we said F the police because they too scared to tell their superiors wa time it is and dont tell the public the truth about how ineffective they are with handling problems that started in the home. so yea its the low hangin fruit they always pickin on. Tortola gon wake up when they realise that the soldiers/warriors of the tribe all in jail or gunned down in the streets because the so called powerful ones that "made" it have failed to make a difference and direct the potential of our men. MALICIOUS is the only word I can come up with for this act. It's funny how police departments all over the world are all talking about using excessive force when officers are assaulted. The police are already telling who their targets are. I'm not defending those who ride scooters recklessly but I'm bothered by them as well. Police will target all scooters and motorcycle operators. You'll see more and more of this violence and they will tell you they have all the rights. Be foolish BVI and think because RVIPF says they're doing all in good that they will do everything on the right side of the law. They won't! You'll see! Be careful that some of you innocent citizens get caught up in BS! Be careful! You see what's happening against blacks in America. You see it's a white man in charge of the RVIPF! You already see what's happening around you in your territory! Can't say nobody didn't warn you! The COP said the RVIPF is targeting UNLAWFUL scooter riders not All!! What a sad thing when you cannot read. Mervin??! No surprise there. Been headed down this road with his type of behaviour. 'Nuff said. Real Leaders, Our Country Needs You! I will not write here and romanticize the Leadership of Lavity Stoutt and Cryril Romney, because they were not all perfect; but if there was anything they possessed - was vision and leadership qualities to take control of situations. What a true leader does in cases where our youths on scooters are becoming more and more out of control? Call an island-wide meeting with all the scooter riders to air out the issues. Not with the opinionated public, but just among a few leaders- political and otherwise. If one of our credible leaders do not step up and do this, it will only get worse. The objective and goals of the meeting are to assist these groups in forming a scooter riders’ association of their own and to agree on some membership codes of the road in which they all can agree - on how they conduct themselves while utilizing the public roads. In this way, they will be given the benefit of the doubt to hold each other accountable for their agreed upon codes/rules of the road. Moreover, they should be also encouraged and given some support on creating activities around their scooter riding interests. Banning scooters and exerting to police possible force, will only channel their misguided energy elsewhere. As a leader, one should learn how to direct misguided energy. Our youths are exhibiting excessive burst of misguided energy. Let’s help them to direct all that energy into constructive developments. Cryril had to squash misguided youths’ energy and gang violence back in the days, and that is how he did it. He knew that if he, as a leader, allowed misguided energy to fester that, that energy can spill over, negatively, into the wider population and the tourist sector, and hence, affect our economy. Most of the youths he volunteered his time, energy, and attention, to back in the days, are now grown people with families and productive work and businesses. I am making this my last post because we are presenting too many complaints and criticisms and too little solutions towards our growing problems. We are blaming everyone else but ourselves and that type of energy only produce more of the same. Watch the video its gone viral.. the cops need to be charged.. We saw that knee to the head! He is trouble and troubled. Two officers were treated for injuries caused by one teenager? Something is wrong with this picture. Maybe, seeing is believing. Riding a Scooter is not wrong, the law permits it. The law permits, and has not changed, the registration, insurance and licensing of a 125cc motor scooter and provides stipulations for its safe, legal and proper riding as well as penalties for the illegal and careless riding. the same principles and law that governs a motor vehicle driven on the road governs a scooter, -- mechanically propelled. what seem to be getting out of hand is the total disregard of the law and what has been provided. The assault did not happen because of the scooter, it happened because this guy had absolutely no home supervision and guidance (someone correct me if I am wrong). It happened because this guy thinks that he is the law and can disrespect any part when it suits hi. Its amazing how people can support such behavior, which simply indicates that their state of mind is somewhat similar. 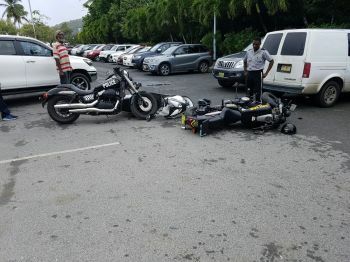 I have seen Officers stopped scooter and motor cycle riders and even vehicles, and the meeting did not end up like this one. It is fortunate that Flerharty is still walking straight, still talking good, and even worst, out on the streets.